The German version of this post can be found here. This article was published as well on The Ecologist, World Rainforest Movement Bulletin, Redd Monitor, Welt-Ernährung und Robin Wood Blog. It sounds like a fairy tale. Multinational companies destroy forests and trample on human rights. Then, international environmental organisations come into play and transform the culprits into responsible companies within just a few months. Multinational palm oil, pulp and paper companies such as Wilmar, Golden Agri, APRIL (Asia Pacific Resources International Limited) or APP (Asia Pulp and Paper) have already completed the magic metamorphosis from destroyers to protectors of the Indonesian rainforest. All of these companies now sport a “zero deforestation policy”. Similar promises have also been made by consumer goods giants like Nestle, Unilever, Mars, L’Oreal, Procter & Gamble and Colgate-Palmolive, who require palm oil as a raw material for their products. Greenpeace, WWF and Co. appear to have success in what Indonesian environmental groups have been struggling to achieve for years, that is persuading notorious rainforest destroyers to make improvements. The scripts of these stories all resemble each other: Initially, a large company group is forced to the negotiating table by a major campaign in North America or Europe. Negotiations are tough but usually lead to a happy end: The company publically announces it will do better and is applauded by the organisations involved in the campaign, who are proud of their achievement. The realisation of agreed targets is left to a consulting organisation, such as the Tropical Forest Trust. Beyond the success portrayed in press releases by the companies and NGOs concerned, critical voices can be heard: What is a no-deforestation promise really worth? For company groups such as APP these deals have come just at the right time. APP has taken over enough land to establish sufficient acacia plantations for its pulp production. This makes it easy for APP to join environmental organisations in their pledge against further destruction of rainforests. Also, Indonesian laws and regulations, like the logging moratorium which entered into force in 2011, have made life harder for rainforest destroyers. As a matter of fact APP has already completed all the dirty work: For years the company destroyed more forest on our planet than anyone. Until a few years ago APP was destroying peat rainforests on the Kampar peninsula. Now, APP is cashing in: The US stationery giant Staples has announced to recommence business with this Indonesian company. Staples had stopped its cooperation with APP in 2008 due to APP’s criminal environmental behaviour. The palm oil company Wilmar, too, claims that no forests are destroyed for its production. This claim has been backed up by environmental organisations since 2013. To maintain an unblemished green image problematic subsidiaries are simply sold, for example PT Asiatic Persada. 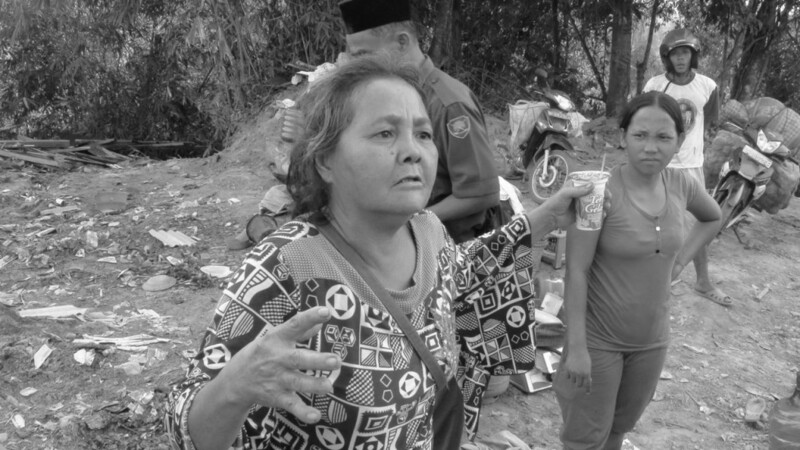 When one of the land conflicts with the local population was becoming more and more intense, Asiatic Persada was sold within the Sitorus family to the Ganda Group, which is managed by the brother of Wilmar co-founder Martua Sitorus. On paper, Wilmar is no longer responsible for that company even though, according to the Indonesian NGO Perkumpulan Hijau, Wilmar still uses Asiatic Persada as a raw materials supplier. The population is now suppressed more brutally than ever. Apart from that, Wilmar has also started establishing palm oil plantations in a national park in Nigeria. The management of APRIL went even further. In anticipation of obligations the pulp giant presented a sustainability strategy in January 2014, just ahead of an imminent international eco campaign. The Stakeholder Advisory Committee installed by APRIL to monitor the sustainability strategy also comprises the WWF. This is particularly remarkable as the same environmental organisation already got ripped off in deals with APRIL in 2005. APRIL simply ignored the agreements and kept producing paper from tropical forests. After a few years, the WWF was exasperated and gave up. Further questions remain unanswered: Could this be a new type of colonialism, NGO-colonialism? Can the WWF, Greenpeace and other international environmental activists still be considered legitimate when making agreements with notorious environmental criminals in Indonesia? Did they actually consult the local population affected by the land claim conflicts with Wilmar, APP, April and Co.? What about local communities right to “Free and Prior Informed Consent”? An expansion stop is certainly not mentioned in any of the companies’ green promises, even though this has always been a key requirement for many Indonesian NGOs when negotiating with their national pulp and palm oil industry. The danger is that other companies might take over the destruction of Indonesia’s primary forests in the future. It seems that the large environmental organisations are trapped in their own campaigns logic. They are trying to keep donors in the industrial countries interested by means of apparent success stories; rainforest and orang-utans have proven to be particularly popular. This is directly matched by the companies’ eco campaigns and green policies with headlines such as “No deforestation” and “Tiger-free ice cream”. Human rights or land rights conflicts no longer play a significant part. Environmental organisations competing for success and brand awareness have even created the paradox situation of hindering each other: One NGO applauds its “partner” company’s new green policy while another NGO would never skip the chance to point out the downside of this partnership. Couldn’t we achieve more in the long term if all this self-centredness was left behind and the international community supported the many Indonesian NGOs and local communities in their actions? They could be strengthened in their role as true advocates of human rights, democratisation and environmental protection and make sure that the land rights of forest dwellers do not only exist on paper. Naturally, this would not be as spectacular as senior level agreements with multi-national companies. In addition, the role of certifiers, inspectors and consulting organisations should be assessed. All of these service providers play a decisive role in implementing eco deals. They operate under names like Pro Forest, Rainforest Alliance or Tropical Forest Trust, and call themselves independent inspectors or consultants. Can they actually be trusted to be independent considering they are paid for their work by the companies they inspect? There is no shortage of examples of so-called independent inspectors in Indonesia producing “favourable” reports. Who says that this is going to change? Why should it? Who exactly is going to ask companies like APP to accept responsibility for the crimes they committed in the past? What about the sense of justice of the past decades’ many APP victims who can now see the same company’s business flourish, applauded by environmental organisations? The author of this article is aware of the many benefits of negotiating with destructive logging companies. Also, international NGOs such as Greenpeace have undoubtedly made a huge difference. Nevertheless, it is important to reflect on the work of not-for-profit organisations as well. This article is not intended to be scholarly but rather to contribute to a discussion. Translated from the German by Anika Burgees.